Exhalation (or expiration) is the flow of the respiratory current out of the organism. In humans, exhalation is the movement of air out of the bronchial tubes, through the airways, to the external environment during breathing. 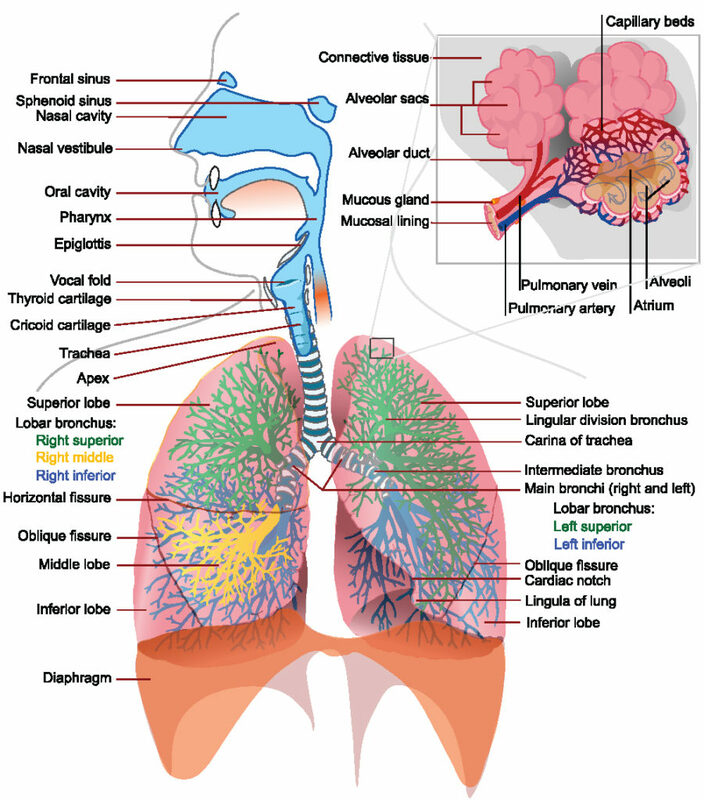 Exhalation is a passive process because of the elastic properties of the lungs. During forced exhalation, internal intercostal muscles which lower the rib cage and decrease thoracic volume while the abdominal muscles push up on the diaphragm which causes the thoracic cavity to contract. Relaxation of the thoracic diaphragm causes contraction of the pleural cavity which puts pressure on the lungs to expel the air. Brain control of exhalation can be broken down into voluntary control and involuntary control. Intercostal muscles: Intercostal muscles are several groups of muscles that run between the ribs, and help form and move the chest wall. exhalation: The act or process of exhaling, or sending forth in the form of steam or vapor; evaporation. Expiration, also called exhalation, is the flow of the respiratory current out of the organism. The purpose of exhalation is to remove metabolic waste, primarily carbon dioxide from the body from gas exchange. The pathway for exhalation is the movement of air out of the conducting zone, to the external environment during breathing. Respiratory System: As the diaphragm relaxes, the pleural cavity contracts, which exerts pressure on the lungs, which reduces the volume of the lungs as air is passively pushed out of the lungs. Expiration is typically a passive process that happens from the relaxation of the diaphragm muscle (that contracted during inspiration). The primary reason that expiration is passive is due to the elastic recoil of the lungs. The elasticity of the lungs is due to molecules called elastins in the extracellular matrix of lung tissues and is maintained by surfactant, a chemical that prevents the elasticity of the lungs from becoming too great by reducing surface tension from water. Without surfactant the lungs would collapse at the end of expiration, making it much more difficult to inhale again. Because the lung is elastic, it will automatically return to its smaller size as air leaves the lung. Exhalation begins when inhalation ends. Just as the plueral cavity’s increased negative pressure leads to air uptake during inhalation, the pleural cavity will contract during the exhalation (due to relaxation of the diaphragm),which exerts pressure on the lungs and causes the pressure inside the cavity to be less negative. An increase in pressure leads to a decrease in volume inside the lung, and air is pushed out into the airways as the lung returns to its smaller size. The pleural cavity is so important to breathing because it’s pressure changes the volume of the lungs, and it provides a friction-less space for the lung to expand and contract against during breathing. While expiration is generally a passive process, it can also be an active and forced process. There are two groups of muscles that are involved in forced exhalation. Internal Intercostal Muscles: Muscles of the ribcage that help lower the ribcage, which pushes down on the thoracic cavity, causing forced exhalation. Note that these are not the same as the external intercostal muscles involved in inspiration. Abdominal Muscles: Any number of muscles in the abdomen that exert pressure on the diaphragm from below to expand it, which in turn contracts the thoracic cavity, causing forced exhalation. This happens due to elastic properties of the lungs, as well as the internal intercostal muscles that lower the rib cage and decrease thoracic volume. As the thoracic diaphragm relaxes during exhalation it causes the tissue it has depressed to rise superiorly and put pressure on the lungs to expel the air. Expiration can be either voluntary or involuntary in order to serve different purposes for the body. These two types of expiration are controlled by different centers within the body. Voluntary expiration is actively controlled. It is generally defined by holding air in the lungs and releasing it at a fixed rate, which enables control over when and how much air to exhale. It is required for voice production during speech or singing, which requires very specific control over air, or even simpler activities, like blowing out a candle on one’s birthday. The nervous system component that controls voluntary expiration is the motor cortex (the ascending respiratory pathway), because it controls muscle movements, but this pathway isn’t fully understood, and there are many other possible sites in the brain that may also be involved. Involuntary expiration is not under conscious control, and is an important component for metabolic function. Examples include breathing during sleep or meditation. Changes in breathing patterns may also occur for metabolic reasons, such as through increased breathing rate in people with acidosis from negative feedback. The principle neural control center for involuntary expiration consists of the medulla oblongata and the pons, which are located in the brainstem directly beneath the brain. While these two structures are involved in neural respiratory control, they also have other metabolic regulatory functions for other body systems, such as the cardiovascular system.